Discounts For Well Behaved Kids…?! 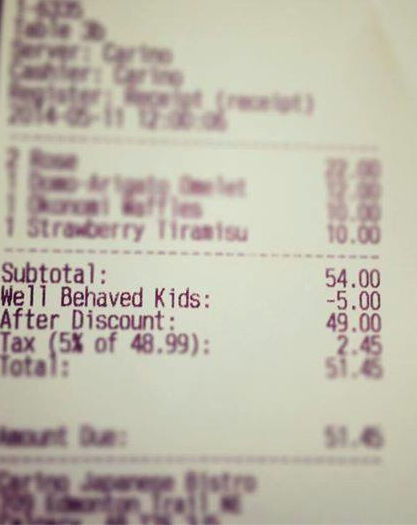 A restaurant in Canada has started giving discounts if your children behave well during your meal. This entry was posted in Behaviour, Better Parenting and tagged kids behaviour in public by Mamasim. Bookmark the permalink. Mmmm, if kids a going to misbehave no matter what the parents do then I can’t see how it would work…. Difficult to know isn’t it? seems like a good idea. Might motivate parents who would otherwise turn a blind eye?